Between GoPros, Sony's Action Cam and even Nikon's recent KeyMission 360, there's no shortage of ways to record the most extreme moments of your life. 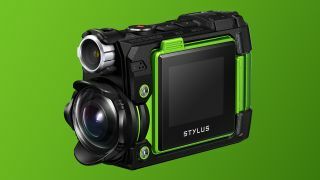 Now Olympus is getting in the game too with a sensor-laden camera named the Stylus Tough TG-Tracker. Olympus calls its new addition the ultimate field tracker and log camera. On top of shooting 4K movies with its 8MP 1/2.3-inch sensor, the TG-Tracer comes with an array of other sensors including a barometer to measure water depth and elevation, compass, GPS and a temperature sensor. The Japanese camera company imagines the camera could be useful for divers (both in the sky and water), as they can look back at the footage while getting real time data on exactly where they were on Earth. Alternatively, the TG-Tracker could be extremely useful for researchers and anthropologists in the field, who need to log everything about their expeditions without having to stop and take measurements. Aside from all the field data, the TG-Tracker camera offers a ultra-wide 205-degree field of view and the seven element lens also opens up to a f2 aperture. There's also a built in headlamp, tilt-out 1.5-inch screens and a built-in five-axis stabilization to help steady your shots and video. The Olympus Stylus Tough TG-Tracker will be available starting in June for $349 (about £240, AU$483).